Floating masses of garbage off some of the Caribbean's pristine beaches offer grim evidence of a vast and growing problem of plastic waste heedlessly dumped in the ocean, local residents, activists and experts say. These "trash islands" have been captured in images by photographer Caroline Power, who lives on Honduran island of Roatan. The problem shows that trash "continues to enter our oceans that leads to the formation of these trash patches," she told AFP by email. "It's an environmental disaster," Omoa's deputy mayor, Leonardo Serrano, told AFP. "We also do not know where the garbage comes from," she said. "One of the main sources are rivers on the mainland of Honduras and Guatemala," she said. "But the rest could come from anywhere. It could come on currents from anywhere in Central America or the Caribbean. "Some of micro plastics have probably floating around for years." During the May to December rainy season in Honduras, the floating garbage dumped on Omoa's promontories and beaches damages the town's appeal, said municipal tourism chief Amilcar Fajardo. "We have found fish, even turtles up to a meter wide, dead after ingesting these plastics," she said. Omoa's town hall pays for beach clean-ups, but the trash washes up faster than the pick-up crews can remove it. "On Friday, we filled 20 dump trucks of 13 cubic meters (460 cubic feet) each, and it made almost no difference," Omoa Mayor Ricardo Alvarado said. "We are even finding bags holding blood" that came from Guatemalan hospitals, he said. 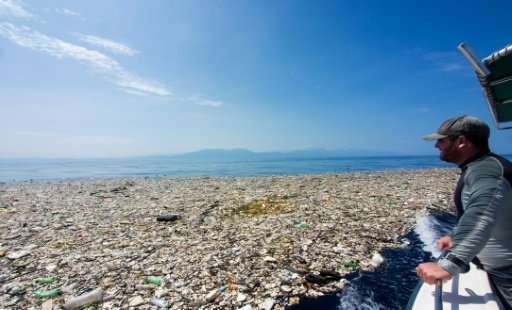 According to the UN Environment Programme, 6.4 million tons of trash end up in the sea each year, with most of it—70 percent—falling into the depths. Some 15 percent stays circulating on ocean currents, while the rest washes up on beaches. This is a third world problem that unfortunately affects others as well. 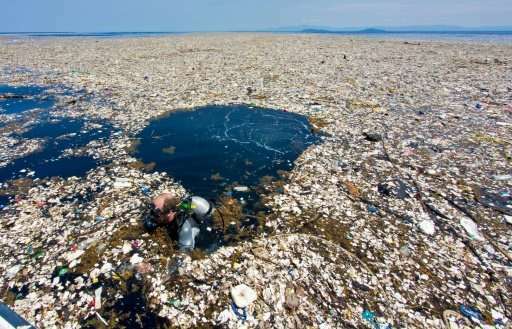 Dumping trash in the oceans was banned long ago in most post-industrial countries. When societies become more free and subsequently wealthy they tend to clean up after themselves as they rise above subsistence living. The obvious solution is to promote freedom. Countries that become free can become wealthy within a generation or two. Mine them for fuel to sell to passing ships. Robotics will take care of this. We will be mining all sorts of garbage. They're already working on them. Use abundant solar power to heat them in pyrolysis ovens and produce cure oil. I wonder which imaginative 'expert' figured that one out?